Are We There Yet?? : Happy Birthday to Lois!! 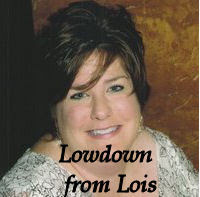 Yet another wonderful September birthday has arrived and this time it belongs to Lois Grebowski from Lowdown From Lois! Swing on by and leave the first lady of Life in the Aluminotti some birthday wishes! You can even tell her I sent you! She's the big 45 today (awww, poor thing!) and she's serving up some cake so stop by, grab a slab, and say "Happy Birthday!" I'll go over and say hello to Lois. Since I'm new to Lois' place, I behaved myself and only took a normal sized piece of CAKE. lois is a baby!!! 45. phooey. a baby!